The developer demolishing the Majestic Theatre has blatantly ignored MBI’s stop-work order issued on June 19 and proceeded to continue demolishing work. 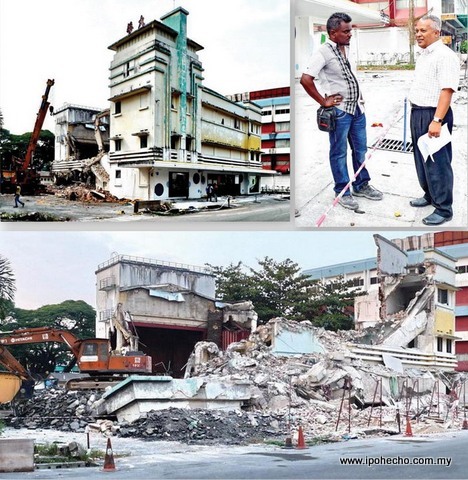 On June 18 Ipoh Echo had received complaints that demolition of the Majestic Theatre was ongoing without the safety requirements such as boarding up the work area. Another requirement to display the project notice board indicating the work being done was missing. Subsequently it was learnt that the owner had not applied for approval to demolish the theatre and a stop work order was issued to the demolition contractor on June 19. Follow up visits to the site on 21 June revealed that work had not stopped with the left front façade now demolished. Also missing was the boarding and notice board. The boarding for the site was seen arriving on Monday afternoon June 25. By this time the entire front façade was a heap of rubble and only the back portion was still upright. A check with MBI’s Building Department confirmed that the owner of the premises had ignored the stop work order. Ipoh Mayor Dato’ Roshidi Hashim when contacted said that legal action has been initiated against the owner under the Strata, Buildings and Drainage Act 133 which carries a maximum fine of RM50,000 or 3 years jail or both. In October 2009 a row of pre-war shop houses being demolished collapsed onto Jalan Kamaruddin Isa in Fair Park killing two men. Following that incident, for safety reasons, all demolition work plans had to be submitted to Ipoh City Council for approval before work could commence. Until the illegal demolition, the Majestic Theatre was the oldest cinema standing in Ipoh. Apart from its wonderful proportionate facade, it carried the collective memories of the people of this City which no amount of fine meted out on the owner-developer by the MBI will ever bring back. Why couldn’t the developer include the heritage building, listed in the Ipoh Structural Plan 2020 – so the owner cannot claim ignorance – and instruct his architect to adapt and re-use the heritage building to increase the appeal of the re-development project, like its sister building in Singapore which is now an interesting commercial building with its facade intact? Is the developer not a son of Ipoh? We heard that those in Heritage is against development or more accurately, re-development. But it seems clear that developers are against Heritage. A sad case, a waste of our built resources and a depletion of our memories, our social and community history. Worse is yet to come. There are numerous big old trees on the adjacent lot which will be removed for this re-development for high-end condominiums, we hear. How much is MBI going to impose on the owner for each of these? How much will it be before it hurts, just so that some of our built heritage can remain for the future generations? The land on which the former Majestic Theater sits on is to be developed with the land behind it, where the former food court which sells toddy (“yeh fa jau”) was located. Together, the developer can plan for a larger development. If the theater is not demolished, this can’t be done. The fine of RM50,000 is peanuts, especially since the developer can’t be compelled to rebuild the shell of the Majestic Theater according to the original design. This is somewhat similar to the felling of the old trees at the Ipoh Garden post office roundabout. The fine too negligible to have any effect. Although there is provision for a jail sentence, MBI must bring the developer to court for this to happen. Will MBI do this? MBI should and must bring the developer to court in this case. If someone was to be jailed, perhaps these wanton acts will stop for fear of going to jail. Roshidi’s term as the Datuk Bandar is going to end. This problem, if it persists, will soon be no longer his but his predecessor’s. This is an appalling story. What should be done is that the developer should be forced to rebuild the shell of the theatre to the original design and then develop the inside to make his profits – for profit is what this is all about. Of course that won’t happen and it will be interesting to see what punishment the courts will mete out. I doubt somehow that an influential developer will actuall be imprisoned and he will soon get back any fine by charging his tenants more for rental in the new development. In my opinion, “most unfortunate” is too weak a position for authority to take. This is much more deserving of the phrase “a criminal act” or similar.